Early in the 18th century, thousands of Africans were being imported each year to the colony of South Carolina, where they were forced to work in clearing land and cultivating the rapidly expanding rice plantations -- plantations such as Arthur Middleton's. In 1678, Arthur's father (Edward) and his uncle (also named Arthur) had moved from the Carribean Island of Barbados to Carolina. With them they brought experience in plantation economics, including knowledge of how to exploit slavery to make great profits. They settled on a 1780-acre tract of land fourteen miles north of Charlestown. Within the next several years, Edward had purchased Arthur's share of the landgrant, plus another 3130 acres. Edward and his wife, Sara, settled on the plantation, calling their home The Oaks. Edward died in 1685, leaving to Sara and their young son, Arthur, a plantation that was not yet profitable. In the following decade, Africans would show English colonists how to cultivate rice in fresh water swamps, and by 1699, Arthur's plantation had begun to make money. By 1720, his estate consisted of over 5000 acres and he owned over 100 slaves. By this time Arthur was a well-established member of the Carolina gentry. "The Spanish are receiving and harboring all our runaway negroes, they have found out a new way of sending our own slaves against us, to rob and plunder us -- they are continually fitting out parties of Indians from St. Augustine to murder our white people, to rob our plantations and carry off our slaves so that we are not only at a vast expense of guarding our southern frontiers, but the inhabitants are continually alarmed and have no leizure to look after their crops." This subject was undoubtedly significant in Arthur's eyes. And it would continue to be. Early in the 1730s, England allowed colonists to sell rice directly to Portugal and Spain. Rice production and profits soared. 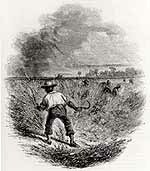 The boom, which lasted eight years, propelled plantation owners to acquire more land and more slaves. During this time Arthur more than doubled his land holdings, adding another 8469 acres. Only three of Arthur's eight children survived. His grandson, also named Arthur and also a major slave holder, would be a signer the Declaration of Independence, play an active role in the American Revolution, and become a delegate to the Continental Congress.